Periyar E.V. Ramasamy published two editorials. Excerpts from them are published below. Gandhi, the great man, who assured to live upto 125 years of age for serving the society, who was acclaimed by a vast majority of people, and who was also taking proper care of his health, has met with untimely death in his 79th year. No other person’s demise has shaken the country as Gandhi’s has. There were a lot of people who were not happy with Gandhi’s policies, even they had a high regard for him. Though the Indians were full of hatred towards the British, the British Government did not falter even a whit in valuing him and protecting him. Except disagreeing with him in his ardent support of ‘varnasrama’. Dravidar Kazhagam did not have much of a difference of opinion with him. They even hoped that he would soon change his adherence to varnasrama. Though he did not seem to like the idea of Dravida Nadu seceding from India, a change of stance in him was foreseen before the end of 1948. Before that could happen a Brahmin bigot has brought indelible infamy on his community through his brutal act. Gandhi was almost 80, and the respect he commanded and the comforts he enjoyed were more than satisfactory. He had passed on all his message to the people and practised them himself. Certainly he had been contented with the life he was leading. The very community he had been supporting and elevating and helped in enthroning has now brought about his end. The Brahmin community, which had been securing its own welfare by inflicting utmost suffering on all the others, has been placed in an undeservingly envious position by Gandhi, whom they have repaid through this nefarious act. It is not just one man’s act, but the ‘way of life’ of the community. It may not be appropriate to blame the community for this. It is mythology and scriptures created by them that have made this country a breeding ground for hatred and bigotry. The British rule and the Muslim rule have been brought to an end. Yet, for the past one year so much of atrocities have been committed in the name of Hindu-Muslim conflict. Can anyone point any other factor behind all this than the Brahminical religion? Again for the Dravida – Aryan conflicts going on in Dravida Nadu at present, and the agitation for secession can any other cause be cited than Brahminical creed? What is surprising in such a religious faith taking away Gandhi’s life? The evil designs of Brahminical religion have been thwarted in Dravida Nadu through the concerted effort of a large number of people. Yet, it looks as if Brahmins will not wait for long. There may be a setback in the position of Brahminism in the North as a result of Gandhi’s fall, and the Hindu-Muslim conflict also may be brought under control. As a result, the Brahmins may now turn all their evil designs against the Dravidian people. The Brahmin community, which had been securing its own welfare by inflicting utmost suffering on all the others, has been placed in an undeservingly envious position by Gandhi, whom they have repaid through this nefarious act. It is not just one man’s act, but the ‘way of life’ of the community. To begin with, the press in the South did not reveal that it was a Brahmin who killed Gandhi, but shamelessly twisted the news, so as to direct people’s fury against Muslims and non-Congress people. They went to the extreme of dishonesty and fabricated news on ‘Black Shirts’ causing ruckus so as to turn people’s hatred towards our organisation. Without the two venomous papers of ‘The Hindu’ and ‘Swadesamithran’ inducing fanatic hatred, our country would have attained progress, harmony, prosperity and wisdom. It is not possible for the country to attain peace and harmony as long as the venomous Brahminical creed remains. We do not say that God or religion cause all these harms. Let them exist in this country just as everywhere in the world. We are, however, totally against the existence of Brahminical religion that fosters caste hierarchy (varnasrama). With all their integrity, intellect and selflessness Pandit Jawaharlal Nehru and Rajagopalachari cannot ensure good governance while retaining varnasrama dharma, which has taken away Gandhi’s life. These leaders must pass an Act putting an end to the caste hierarchy and ban following of all scriptures and tradition which foster it. All communal organizations must be made illegal. That will lead to the fostering of democratic spirit and socialism. Gandhi was a noble person who dedicated thirty years of his public life for the welfare of the people of the Indian sub continent with total self abnegation and went ahead with what he considered right. 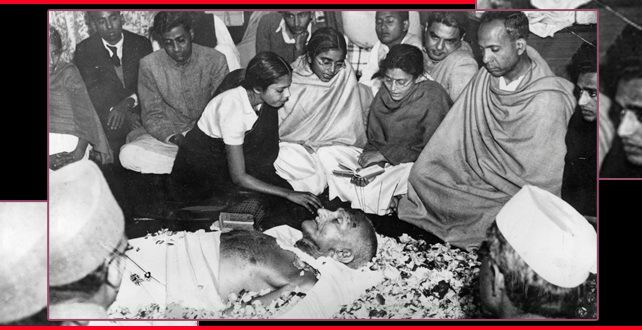 His method was non-violence (ahimsa) and he had no faith in violence. In religion, he insisted that there was no difference between religions as all of them had the same goal. As for god, he emphasized that there was only one God who was depicted in different ways by different people. Temples which must guide people towards god, he said, had became brothels. He held that an open space was sufficient for worship and there was no need for a middleman, and no need for any offerings to the deity. He opposed idolatry and advocated prayer. In society, he decried exploitation of any section of people. He also regarded it shameful that a section of people were kept depressed. We have considered that these policies were fairly sufficient for solving the problem of our country, riddled with religious and communal differences. Yet we felt that the methods he followed for propagating them might end up producing undesirable results. Now that he has disappeared from the scene, should we not introspect as to how far we have progressed, if not why not and what should be done to achieve it? How else can we proclaim that we have followed his policies? It was Hinduism which put an end to Gandhi’s life, since it was felt that Gandhi would endanger its existence. How can his death be used for the development of the same religion? Real homage to Gandhi would be to destroy all the forces he dubbed as retrograde. Not only the Dravidian, but all the nationalities in India must ponder over these matters. Hinduism considered that Gandhi’s living will endanger its existence. Then should his demise be used for the progress of the same religion? Those who constituted the highest caste tried all strategies and guide to subjugate all the others, in the name of scriptures and tradition. Should this great man’s demise be used by these fraudulent people for ensuring their own welfare? On the thirteenth day of his death, his ashes were dissolved in the sacred rivers of the country as a religious rite. A number of people witnessed and worshipped it. Such happenings are bound to sadden anyone who follows rationality. Gandhi’s assassination, following the initial shock, has filled us with a determination to do something to express our gratitude to him. All the scientific products which were created by conquering forces of nature have been converted into objects of worship in our country. Even books which give us knowledge are being worshipped, instead of being put to their genuine use. It is such attitudes and practices which have been responsible of the downfall of the country with a glorious past. Gandhi reared the cruel snake of Brahminical religion, feeding it with milk. He believed that once freedom was attained, it could be tamed. But after freedom was attained, when he felt that he had brought it under his control, it had preyed on him with his fangs. What should we do with it? We don’t recommend that it should be altogether crushed. We only want its venomous fangs to be removed. How to do it? It must be realised that Hinduism which was created for the growth of Brahminism is responsible for the degeneration of the society, and we must detach ourselves from it. Let this country, which is divided into races and religions, follow a progressive path which will create one nation, one caste and one religion!